The Boulder Overlap Liner offers a pattern of boulders which cover the top border of your pool walls followed by a shimmer pattern that covers the rest of the wall and pool floor. 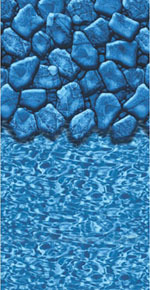 Our Signature Collection Above Ground overlap Liners will fit most 48", 52", or 54" pools. And installation is as easy as 1,2,3. After your have your pool floor complete and your wall assembled, place your liner into the pool, drape the excess over the wall, place your coping strips over the liner to secure it to your wall, and then just place your top seat to finish the process.